Thanks to the color luminance of all ClimateActivePaint products any roof is going to gleam widely visible. This luminance lasts for a long time period. ThermoActive - water proof - even under extreme weather conditions. Due to the reflection of sunlight and the resulting dissipation of thermal energy on the surface, many material joints can be by-passed and kept free of cracks. ThermoActive coating gives sustained protection of roofing against harmful environmental factors such as UV rays, smog, dirt, acids, salt and sea water as well as against the weather elements such as rain, snow and hail. Even roofing made of fibre-cement tiles (Well asbestos) or zinc plates pose no problem for the coating. Durable roof protection is established after the zinc-plated roof has been pretreated with ClimateActivePaint Rust-Primer. This will protect the ferrous and non-ferrous subsurface against corrosion. The unusually strong bonding of all common roofing materials is possible thanks to ThermoActive's special composition made from high-quality raw materials that create an especially strong adhesion to the surface. 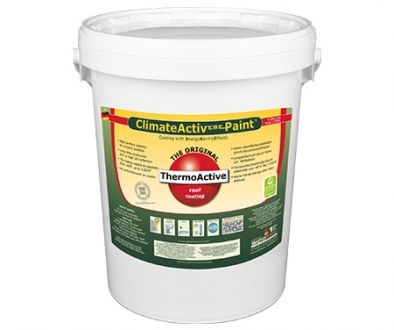 ClimateActivePaint ThermoActive retains its elasticity in temperatures ranging from -40 C through +138.8 C. You will not have to worry about cracks due to loss of elasticity. With roofs that cover a large area, the coating helps to absorb the noise associated with hail or rain.